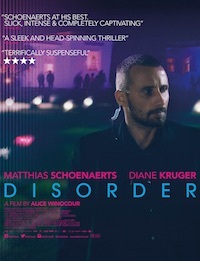 Schoenaerts is at his brooding best as Vincent, a French special forces veteran recruited for private security work, protecting a secretive billionaire’s wife (Kruger) and son. The superb editing, sound design and electronic score bring us inside Vincent’s restless, hypervigilant state of mind – but is he merely paranoid, or are his charges in grave danger? Tense and occasionally explosive, Disorder is one of the best and smartest thrillers since Drive.